Completed M.B.B.S. in Thanjavur Medical College, Thanjavur (2006). 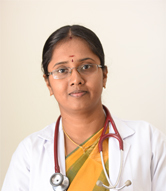 Completed M.D(General Medicine) from Coimbatore Medical College, Coimbatore (2013). Has won best award for the poster presentation in TAPICON 2012 0 Dr.V.Palaniappa Medal. Thesis : Comparitive Study on the outcomes of acute Myocardial Infarction in Diabetics versus non-diabetic subjects. Scientific Paper - “Primary Sjogren's syndrome presenting as Pleuritis” in med ej, Tamilnadu Dr.M.G.R. Medical University, Chennai (2012).